The key to the superior performance of the BNSL6 comes from the extremely durable, efficient and lightweight body design. Starting at 5.2, pounds it is the product of computer generated solid modeling and FEA stress analysis technology. Full length stiffening ribs and a reinforced radial transition from the piston bore housings to the closed end bridges have produced the strongest Superlite caliper bodies ever built. 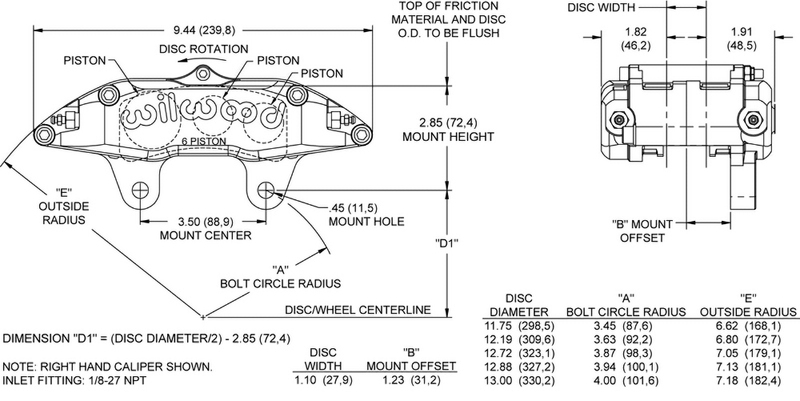 When compared to open bridge calipers that use tube or stand spacers between the body halves, the closed end bridge design is measurably stronger with less separation or deflection under load. Additional strength and resistance to deflection comes from the four high-strength steel end bridge bolts. A fifth center bridge bolt provides even more overall strength and easy access to the pads without the need to remove the caliper from the mount. A unique six-piston differential bore configuration provides balanced loading for even pad wear in sustained high heat environments. The standard SL6 calipers feature one-piece stainless steel pistons. Stainless is used for its slow heat transfer properties and high resistance to corrosion. In addition, each SL6 is equipped with SRS bridge plates. SRS plates eliminate all bridge wear caused by pad gouging and extend the service life of the caliper. The spring-loaded action of the SRS plates also eliminates pad rattle and dampens the harmonic vibrations that contribute to pad squeal. Two piece bleed screws are recess mounted to shield them from track debris and other potential damage sources. High temperature, square faced bore seals provide the largest possible sealing area and controlled piston retraction on release. The full range of Wilwood pad compounds is available to match the brake response and heat range of any competition or sports driving application.